Within minutes of a headache after taking this product, I get instant relief. Thank you for sharing! We hope to hear from more customers that experience similar relief. Not my first attempt at CBD for migraine relief, but it seems to just not do anything for me. I intend to keep it around, however, to supplement my prescribed THC. Thank you for taking time to share your experience. Your prescribed THC is likely to also contain the balancing benefits of CBD. Supplementing with additional CBD is a good option. You know you best. It was another thing to try in order to get some relief. Though it didn’t work for me I think migraine sufferers are all different and its worth trying regardless of how it worked for me. The taste is not so great. CBD can be very subtle. Your post HIT6 test score is promising. Thank you for taking time to share this feedback. 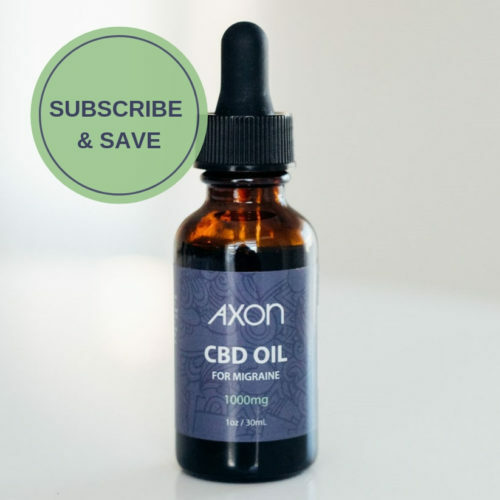 I’ve been using Axon CBD for one month to treat chronic, persistent migraine as well as chronic pain. It helps to relieve some of the anxiety associated with these conditions and takes my pain down a notch or two. As a bonus, it has a very nice flavor. 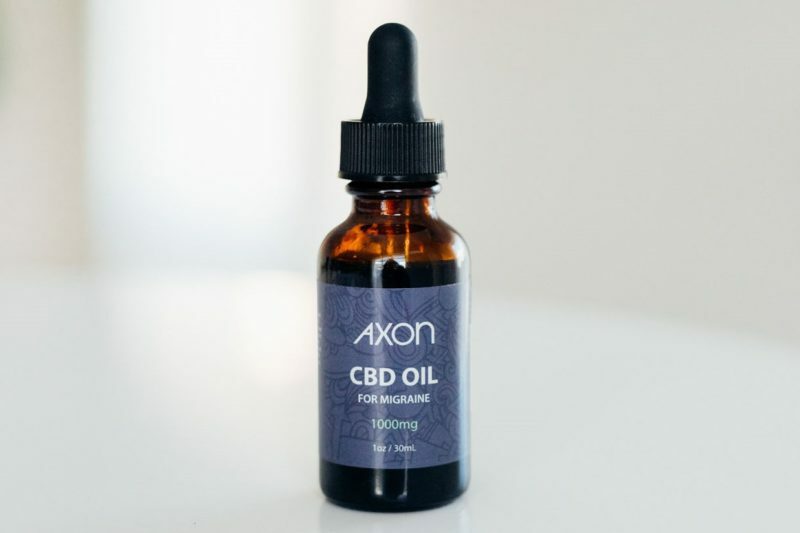 We are so glad to hear that Axon CBD Oil is effective. Anxiety, seizure, nausea and pain are some of the most common conditions supplementing with CBD. It is certainly promising! I have not tried enough to give good feedback yet. I will try and be more consistent about using. I need to put somewhere where I won’t forget and take more often when I am having a headache or migraine.The taste is kind of funky but I usually just drink something after taking. We find that placing it under the tongue rather than directly on taste buds is the most effective and pleasant. It can be described as an earthy or grassy taste. Many people describe it as mild, but it can be very individual. Thank you for sharing! This is a very good product. The only issue was that I had to go scour the internet for how to use it since the product didn’t come with directions for use or options for how to use it. I’m still not sure I am using it right for its full affect. It appears to help on my migraine days, but I need to use it longer to really see its full potential (and play around with dosing). 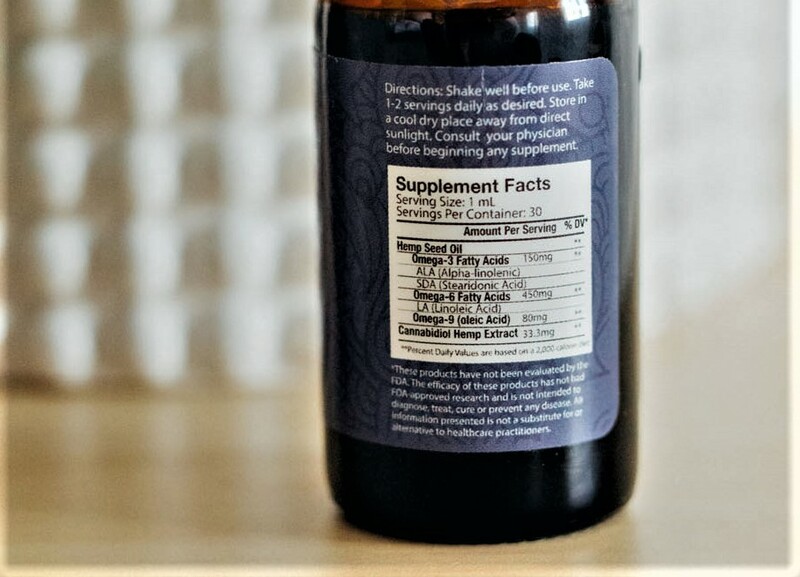 The dosage recommendation is on the back of the label, but it is small due to the bottle size. There is no magic dose for everyone. 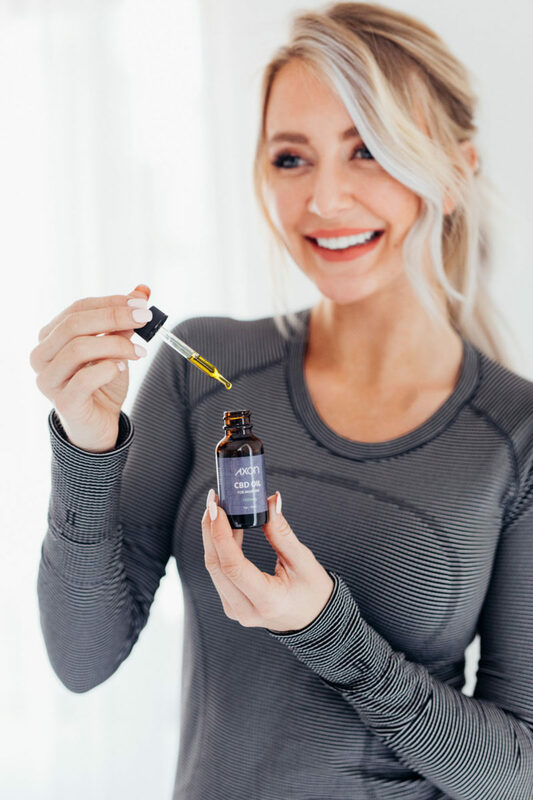 However, Axon CBD Oil serving size is 1 ml (one dropper) and there are 30 servings in the bottle. The amount of cannabidiol is 33.33mg per 1 ml of hemp oil, which is considered high potency. 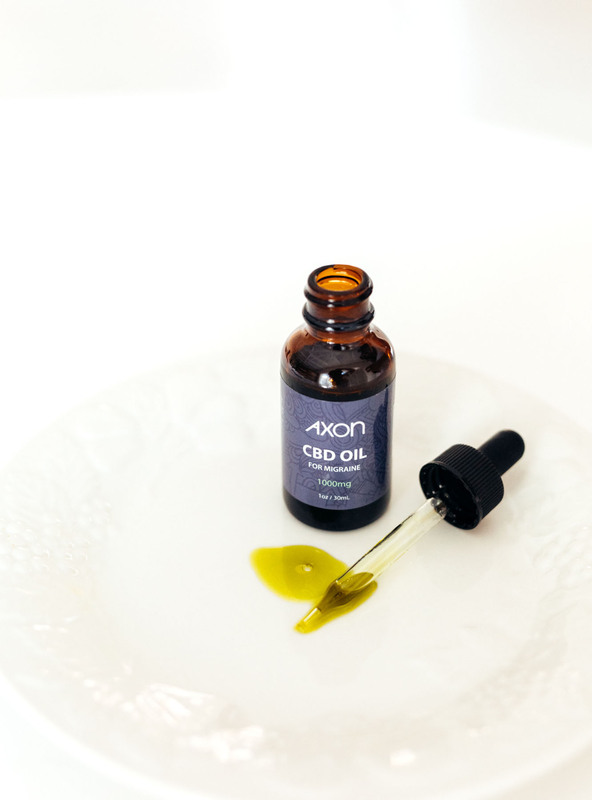 Axon CBD Oil is to be taken through the mouth. Most people use it as a sublingual by dropping the oil under their tongue and holding for 30-60 seconds. I give the CBD oil 5 stars. I take it every night before bed and it helps me calm down and sleep. I also take a dropper whenever I have a migraine, and I’ve noticed a decrease in the duration of my headaches! I have not noticed significant improvement, but I will continue to use more regularly in hopes that it will help more. I will update my review then. The taste is not great, but CBD oil has helped decrease the severity of the headaches and migraines. My experience with Axon CBD Oil was good… and a little bit surprising. As a person with complicated migraines (hemiplegic and acephalgic) that are often instigated by changes in the barometric pressure, lack of sleep, and stress, the timing for this bottle of CBD couldn’t have been better. The holidays, starting a new job, and developing bronchitis that refused to stop were really the making of the “perfect storm” for one of my migraine episodes, but shockingly, it never happened. With the exception of one kind of “off” day during the past month, I have felt great, despite the odds stacked against me. I slept better, felt calmer, and experienced far fewer issues with my vestibular system than I would have expected given the less than ideal circumstances. The only issue I had with the supplement was the texture. The flavor was light and pleasant (slightly nutty), but I would be much more likely to take it on a daily basis if it were offered as a capsule. My only concern with taking it as a capsule would be the potential delay in assimilation, as I held the oil under my tongue for 30 seconds before swallowing to speed absorption through the blood vessels in the mouth. All things considered, I am very pleased with Axon CBD Oil and wouldn’t hesitate to recommend it as a viable option for migraine sufferers. Thank you for sharing. We are hearing more feedback that taking it as a sublingual is effective. Since I started using the CBD oil supplement I have not had a migraine. Using the glasses had reduced my symptoms, but the CBD has taken the headaches away. I went from multiple headaches a month to none. Also, I am less anxious. This is awesome feedback. We are so glad you have found relief. Thank you for sharing and for choosing Axon. I feel like it helps to alleviate minor headaches. 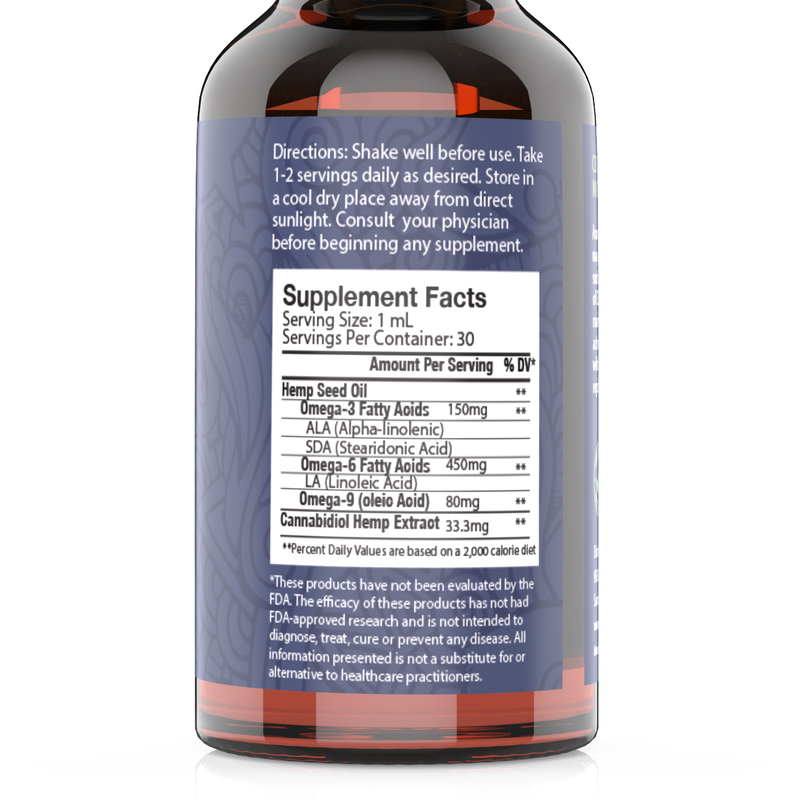 I get headaches so frequently, it’s hard to tell what’s helping but this product was easy to take and it seemed to help. I will continue to use it! Thank you for this feedback and for using Axon Relief. I do not have ‘normal headaches or migraines’. They last months not hours. Did not like no instructions ie: place under tongue, one dropper or two? Used product in an attempt to find relief. Thank you for this feedback. The instructions are on the back of the label and on our site. 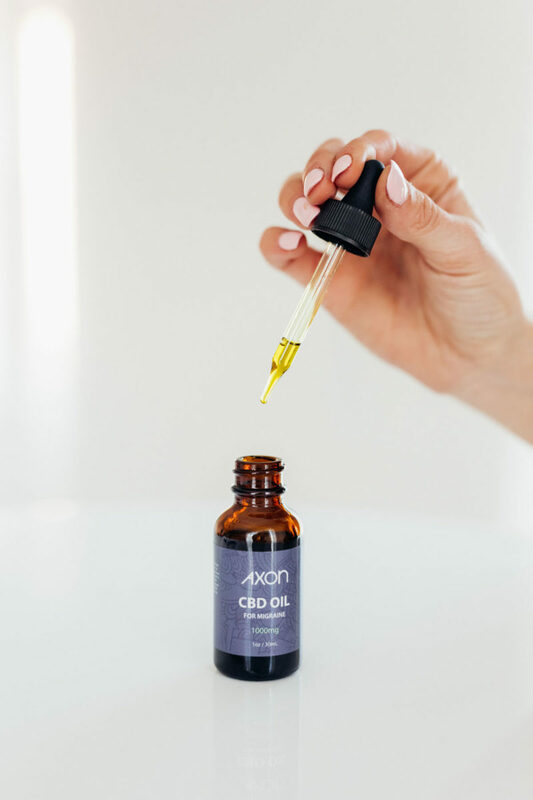 The Axon CBD Oil dosage recommendation is 1 ml (one dropper) taken orally or placed under the tongue. There are 30 servings in the bottle. I think you need to use it on a daily basis to be effective. We hear from customers that take it daily and as needed, but daily as a sublingual is the most popular. Thank you for sharing. Thank you for sharing. We are glad you are having fewer migraines. Axon has worked great for me. Great! Thank you for sharing this review. I suffer from severe, chronic migraine. I am prescribed preventative and abortive medication. While this product does not work for me by itself, I am glad to add something to my treatment plan that I can take with my other medications and not have additional side effects. Many customers need a “toolbox” for migraine management. Thank you for this feedback and for choosing Axon Relief. I liked that the product had little taste or odor to it and seems to be helping my migraines and possibly joint pain. We are glad your pain is reduced. Thank you for sharing. I think that the severity of my migraines has diminished since I started using the CBD oil, but the overall number has not yet decreased. I’m not a fan of the taste, but I stirred it into unsweetened applesauce, and that seemed to work. In addition to lessening the severity of my migraines, I have also noticed that the inflammation in my hip has also decreased. I am sensitive to changes in barometric pressure as a migraine trigger, and my area had lot of fluctuations during the month-long trial period, so I am hopeful that the CBD oil will be more efficacious as I continue to use it. Applesauce is a great idea. Thank you for sharing! Since using the CBD oil my migraine pain scale is about a 4 as opposed to a 9 or 10 pain as previously experienced. Yesterday I had another episodic migraine. It was bearable. Although I was disappointed to get a migraine, I was able to manage through it. Before CBD I lost 3 days to pain and nausea and then 3 more days to brain fog. Another huge benefit of the oil is I no longer feel scared or apprehensive. Always afraid of when and where I would be when an unexpected migraine would hit. I also buy the Axon glasses and have several pairs. I have a pair in the kitchen, car, and other rooms for easy access. They too have been a life saver. I really struggled before I ‘found’ Axon. Reduction in frequency or intensity can be a huge win! Thank you for choosing Axon Relief and Axon Optics. I think this oil is a helpful addition to someone who already has a good migraine regimen, but needs a little something extra to help on those severe days or to manage the milder headaches if you are chronic. I am chronic and am on multiple daily meds, as well as Botox, and I feel this has helped decrease the number of mild headache days that I have. I’m not sure if it’s helped with my severe migraines, but I’ve taken it every day just in case. I do think there needs to be a scale on the dropper, for more accurate dosing, but other than that, great product! Thank you for this feedback and recommendation. Been using daily for one month. First 3 weeks had fewer migraines but then had a rough 4th week. Going to keep using for now! We hope you continue to see a reduction in the number of migraines. Thank you for sharing this feedback. I bought it for chronic daily migraines. What I most noticed is that my back pain is a little better. We hope you continue to feel relief! Not sure this product has done anyting for my migraines. Thank you for sharing this feedback. I use the CBD oil and the glasses. Both have helped my headache days. We are so glad that Axon Optics and Axon Relief are in your migraine “toolbox”. Thank you for sharing! Effective however do wish it were a bit more palatable. 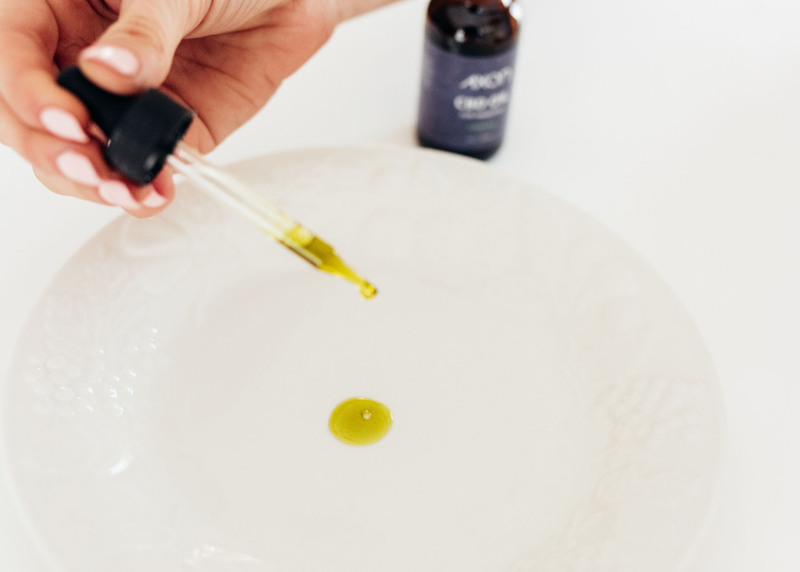 I use another oil mixture that adds a touch of tangerine essential oil plus monkfruit to mixture and it really does make it easier to tolerate letting oil sit under tongue easier then to swallow. Tangerine and monk-fruit are great suggestions! Thank you for sharing. I’m not sure if the CBD oil makes a difference with migraines. Thank you for trying Axon Relief and for sharing this feedback.